distance from the historic centre of Taormina. Perched on a terrace overlooking the sea, the Grand Hotel San Pietro is just 800 m from the historic centre of Taormina, which can be reached by a free shuttle bus service or a short walk lasting no more than ten minutes, which offers an opportunity to admire the fine landscaped public gardens of the “Villa Comunale”. A luxurious refuge set in a lush Mediterranean garden, the Grand Hotel San Pietro looks out over the Ionian Sea and has a fine panoramic terrace. The hotel is spread over six floors, connected by two elevators. It features an impeccable classic décor with welcoming ambiance, and 5-star luxury services, from the restaurant to the pool, from the pool bar to the beach services. Welcoming and stylish, the 63 rooms of the Grand Hotel San Pietro are marked by the elegance of their furnishings and the care paid to detail. All rooms have independently controlled AC, satellite TV with flat screen, Wi-Fi connection, electronic safe and en-suite bathroom with shower or tub. The rooms may also have a sea view and lounge area. The sea is about 200 m away as the crow flies and guests have at their disposal an equipped pebble beach, at 3 km distance, with special price. The beach service for € 25 per person, per day includes 1 parasol, 1 sunbed and shuttle service. A breathtaking view and gourmet cuisine, the hotel restaurant offers an unforgettable food experience, with dishes taken from Sicilian and mainland Italian cuisine. Guests can choose between the indoor restaurant or the panoramic terrace; the stylish layout and atmosphere make Il Giardino degli Ulivi the perfect backdrop for lunches and romantic dinners. There are two bars: the Bar "La Melarancia" and the Pool Bar. The cost of your stay includes buffet-style breakfast, private vehicle parking area (no surveillance), free Wi-Fi connection available throughout the hotel, use of pool, fitness room and communal areas, the shuttle service for the centre of Taormina. Payment of a supplement will ensure the services of a baby sitter, wellness treatments, use of the meeting hall, tours and excursions, transfers to and from Catania Airport, vehicle and mountain bike rental. Pets are welcome up to 15 kg, at a rate of € 30.00 per day. Spacious and luxurious accommodation, with a comfortable bedroom and an inviting lounge corner. 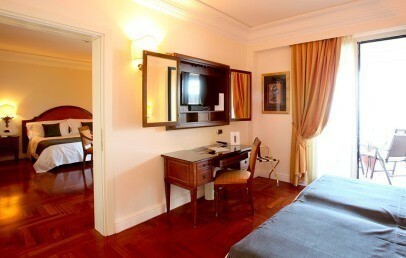 The Junior Suites are located on the first and second floors of the hotel. To complete the picture, a sea view balcony where breakfast or dinner can be served (on request), to start or end the day contemplating the magnificent panorama of the Taormina Riviera. 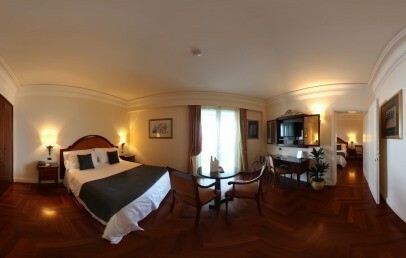 On the first floor of the hotel, the Garden Suites offer spacious and elegant accommodation with bedroom and living area. What makes them special is the private balcony with view over the Mediterranean garden surrounding the hotel. Here the scent of the sea blends with the fragrance of bougainvillea and pine. Spacious, full of light and furnished in period Sicilian style, the Deluxe rooms with sea view equipped balcony offer guests a stay packed with beauty and convenience. Executive rooms are cosy and functional. The windows offer picturesque views of Taormina and the ancient access road to the town. Double glazing guarantees silence and tranquillity. 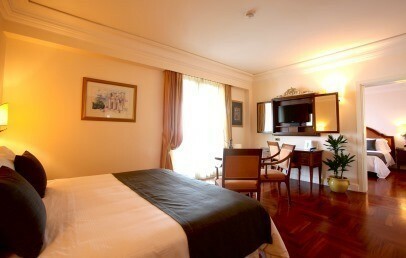 Spacious rooms located in the north wing of the hotel. The rooms have two separate bedrooms each with a double bed, bathroom and balcony with sea view (also the balconies are interconnecting, total surface of 35 sq.m.). They offer a Sicilian-style décor and all modern conveniences for a family stay. Early Booking - Book within April 30th 2019 and get a 15% discount on your stay (valid for stays from May 31st to November 1st). Advance Booking - Book at least 45 days in advance and get a 10% reduction on your stay. Long Stay - Book at least 4 nights and the last one is free of charge! Advance Booking - Book at least 45 days in advance and get a 20% reduction on your stay. Advance Booking Rate - Book at least 7 days in advance and get a 15% reduction on your stay.